Revisiting space literature from the late 1970s still turns up many surprises and “alternate histories” of an age yet to come. One case in point revolves around the Space Shuttle mission timeline depicted in 1978’s Observer’s Book of Manned Spaceflight, written by veteran BBC aerospace correspondent Reginald Turnill. The pocket volume, which boasts “8 colour plates and 80 black and white illustrations,” also provides a list of what are optimistically described as “provisional” Shuttle missions at the front of the book, and a space shuttle operational profile at its end, which discusses vehicle turnaround capability. While the Shuttle was meant to fly by 1978, for many factors (such as issues with the Space Shuttle Main Engines and the Thermal Protection System) this didn’t happen, so the Turnill book provides an alternate timeline of when and what. For example, OFT-1 (later to be known as STS-1) was slated to launch in June 1979. OFT-2 would provide a more interesting story of a spaceflight “what if.” Slated for July 1979, this mission was to see the third crew (Haise and Lousma) take a Teleoperator Retrieval System (a sort of IUS) to the ailing Skylab space station, which hadn’t seen a crew since February 1974 and was beginning what would become its terminal drift back to Earth. By November 1980, the Shuttle system would already be on its 10th flight; by January 1982, a “Jupiter Orbiter/Probe” would be launched utilizing an IUS stage on the Shuttle’s 23rd (!) mission. One can assume this probe was what would become Galileo, which, for a time, was meant to be propelled by a liquid-fueled Centaur-G Prime upper stage on a direct flight path to the gas giant. Another cool detail is how two Tracking and Data Relay Satellites (TDRSS) were planned to be launched via Shuttle respectively in July and November 1980. Shortly thereafter, the first joint NASA/ESA Spacelab mission was to be flown. A NASA engineer explained on the Facebook group Space Hipsters, “Spacelab was a heavy user of the TDRS high-data-rate Ku-band channels.” The two communication satellites were probably being sent up first to facilitate the Spacelab missions; the manifest details that five Spacelab missions were to fly before 1982. Looking back 41 years, the most noteworthy parts of this timeline involve the sheer number of Shuttle missions, and proposed turnaround time. For example, the front section details proposed launches from both Kennedy Space Center and Vandenberg Air Force Base, including NASA launches, government missions, and commercial flights, among others. The total number of projected shuttle missions between 1980 and 1992 was listed at 487 flights, with a turnaround rate of two weeks. Of course, avid space fans know what really happened: when Columbia arrived at Kennedy Space Center in 1979, it didn’t even appear half-finished. OFT-1 would morph into STS-1, and would launch on April 12, 1981. The first four crews, too, would see its share of changes. Haise would leave NASA in June 1979 – a month before his proposed “Skylab reboost” mission was to have taken place. 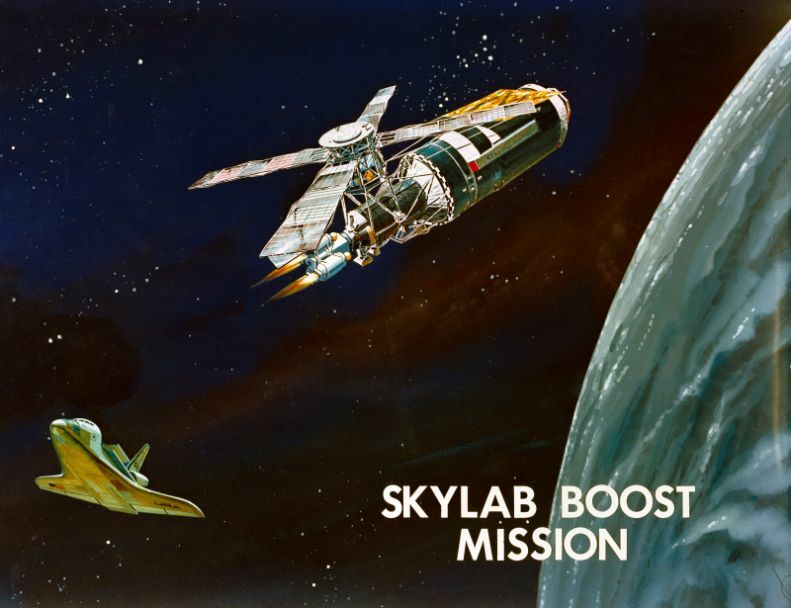 In July 1979, Skylab, too, left NASA (so to speak – it reentered over the Indian Ocean and parts of western Australia). 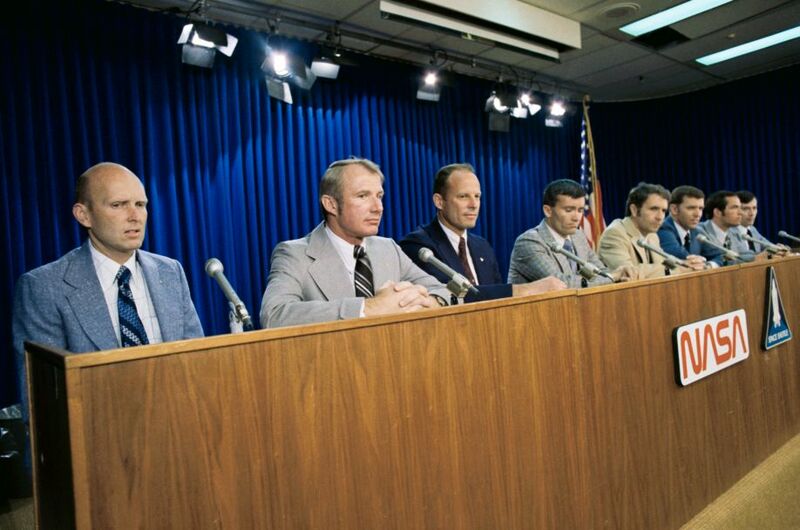 Lousma and Fullerton would fly together on what became STS-3 in March 1982, while Thomas “T.K.” Mattingly and Henry Hartsfield would be paired on STS-4 in mid-1982. Brand’s opportunity to command finally arrived in late 1982, with STS-5 (billed as “the first operational shuttle mission,” in which the crew of four flew sans pressure suits, and ejection seats). Only one TDRS spacecraft, launched from STS-6 in April 1983, would support Spacelab 1, which flew in late 1983. Fifteen Shuttle missions were planned for 1986, despite many previous close calls (including one abort-to-orbit) and known design concerns. This author detailed issues including booster joint blow-by and the audacity of putting a liquid-fueled stage on the Shuttle in a 2015 Ars Technica article. “People who followed things closely recognized the problems. The ‘Space Shuttle’ section of Jane’s Spaceflight Directory 1986 (which was largely written the year before) underscored the risky nature of the early program: ‘The narrow safety margins and near disasters during the launch phase are already nearly forgotten, save by those responsible for averting actual disaster.’” Unfortunately in January 1986, disaster would come to pass. While the early Shuttle manifest was impossibly optimistic, it’s still fun to revisit “nostalgia for an age yet to come.” We can still dream of a future – even if it’s a distant one – where spaceflight might become as frequent (if not as routine, or risk-free) as a cross-country plane trip. I kind of want to hug sad Fred there. I know, I want to give him his chance at STS-2!